Today we are interviewing Patty Hevly, author of the children's book Chasing Tony. I wrote stories as a child and have recently rediscovered this side of me in Chasing Tony, which is my first book. I am an all around artist and have been doing a lot more illustrations over the past couple years, which helped feed my inspiration for this book. In addition to writing and illustration I also enjoy design, photography, jewelry design, painting and metalwork. Tony the squirrel takes Bobby and Emily’s ice cream money resulting in a game of chase around the park. 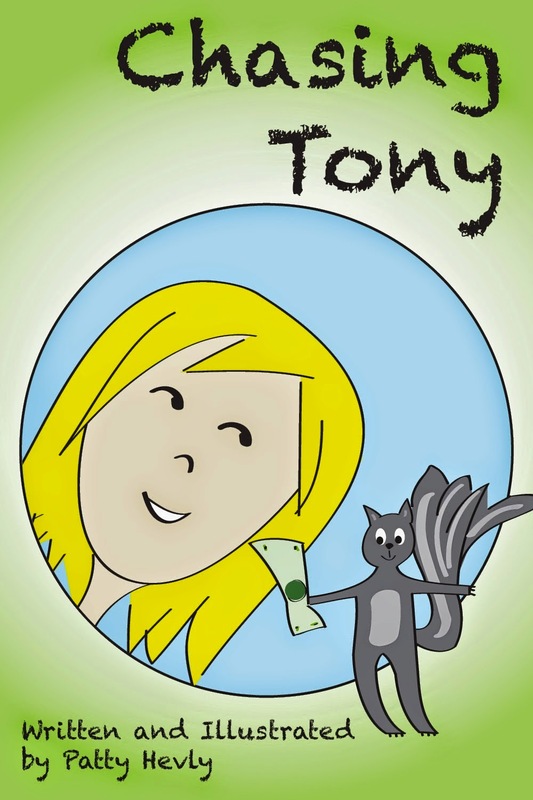 The book shows all the ways the kids try to catch Tony, which is a great conversation starter about what is nice and not nice behavior. Eventually showing that being polite and treating others nice will be your best bet. Who do you think would appreciate this book most and why? It is a great social skills book for kids 5-7. It is a fun book with humorous mischief that helps parents talk with their kids about their behavior and interactions with others. It originally started out more science based with the kids running around the park and talking about trees and birds. I ended up having so much fun with Tony and his escape methods that I ended up re-writing the whole thing and making it social skills based instead. Definitely Tony. He had so much personality and I had fun figuring out all his crazy methods of escaping Bobby’s attempts at catching him. Of course, I have a special fondness for the character of Bobby as well, since he was inspired by the memory of my dad, Bob, who got into a lot of mischief in his youth. You also illustrated this book. What medium did you use? It was all digital. I drew and colored the illustrations using Illustrator, then layed out the book using InDesign. How long have you been active with art? What got you into it? I have always had an interest in art. I would say it is my true passion. My walls are covered with different styles of art and I love to try and practice different mediums. I enjoy painting, mixed media, photography, illustration and in the past year have been working with metal in jewelry and sculpture. I enjoy the combination of doing both hands on art as well as digital drawing and animations. I want to turn Chasing Tony into a series based on other social skills and behavioral issues. I also have a couple other one-off book ideas I’d like to pursue. I am a classic case of too many ideas and too little time. I will probably do one of my one-off ideas first then another Tony the squirrel book. I plan to release a Spanish version of Chasing Tony soon and would like to make Chasing Tony into a book app as well. I wrote stories as a child, but it has only been this past year when I thought about writing a children’s book. It has been a great, and I plan to write many more books. Ayn Rand’s Fountainhead is a favorite. I think because I see a lot of myself in her character, Howard Roark. I am more of an artist than a designer. Once I get an idea in my head it is hard to adjust it to what other people want. I am in a bookclub which helps me explore books I may otherwise never read, however on my own I like literary fiction, suspense, chick lit and some romance. I think it is a fun and entertaining book with somewhat quirky illustrations that kids will enjoy. It‘s fun, but also helps teach kids about what is nice and not so nice behavior. Though kids can read on their own, I think it is more beneficial to read aloud with your children to create a conversation about the not nice and nice behavior.